Timmy Time: Happy Birthday Timmy, from Lionsgate and HIT entertainment, has a running time of 46 minutes and the target age is 2 -5 years. You can find it at Amazon for $11.93! Keep up with Timmy Time on Facebook. Giveaway will end July 26th at 11:59 pm. I was given the above dvd to review. No other compensation was received. All opinions are my own. This promotion is in no way sponsored, endorsed or administered by, or associated with, Facebook. We hereby release Facebook of any liability. Winner(s) will be contacted by email 48 hours after the giveaway ends. If you have any additional questions - feel free to send us an email! Haven't seen this show yet, but looking for cute ones for my son! This looks like a cute dvd! Thanks for the giveaway! Looks like a cute one! Sheep are my favorite animals! We have not seen this show. It looks like a show that my kids would like to watch. My daughter loves anything to do with birthdays. great show for my boys to watch! 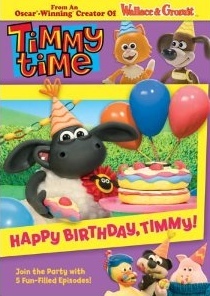 My kids loved Shawn the Sheep - so Timmy Time should be fun as well. Love this for my girls they would really enjoy. We love Timmy! Thanks so much for the giveaway! Timmy Time is on of my daughter's favorite shows right now!